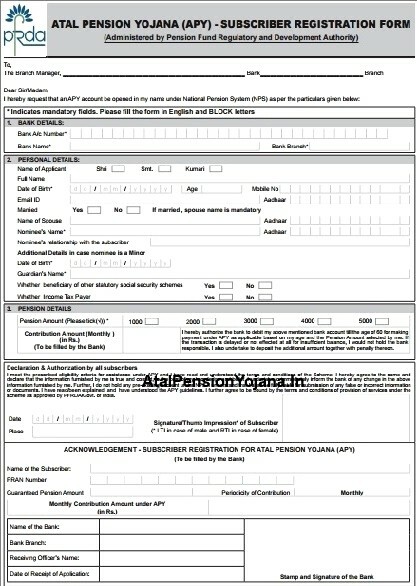 Atal Pension Yojana (apy) Scheme Application forms in English, Hindi, Bangla, Tamil, Gujarati, Kannada, Marathi, Odia & Telugu. The Atal Pension Yojana enrollment is valid only those, who have a bank account. Mandatory details required to apply for the Atal Pension Yojana. In the first section, account holder’s Bank account number, bank name and the branch of the bank is required. In the second section, personal details like name, date of birth, age, mobile number, Aadhar id, email id if any, and married or not. If the account holder is married then the name of the spouse and aadhar detail of the spouse is mandatory. For the same, nominee of the APY account is also required. Apart from all this, the applier must fill, if any social security scheme he/she falls under and also if tax payer or not. In the third section, applier would have to fill in the amount of pension the account holder is interested in. One can select among available 5 options that are 1000 INR, 2000 INR, 3000 INR, 4000 INR and 5000 INR. At the bottom of the form, the applier is required to sign the form along with the date. When the atal pension yojana form is successfully submitted to the local bank branch, the applier will receive acknowledgement slip from the bank manager. The atal pension yojana forms are available in many languages. All Indian Banks have the same form for Atal Pension Yojana. Sir, I am dipak, how can I claim my pension after competing my age 60? i am apply to APY and also first ECS debited on my bank.. But hard copy of APY not received by SBI bank. they told me we have don’t information about it. what can i do..